Specialist fire crews based at either end of the Channel Tunnel are primed to deal with incidents such as Thursday evening's freight train blaze. Now that the fire is out, their attentions will be focused on finding out how the fire started. The French authorities have taken on responsibility for determining the cause of the fire, which brought chaos to thousands of travellers planning to use the Channel Tunnel. While a terrorist attack was an early fear, officials appear to have quickly ruled out this out. Initial findings suggest the blaze started accidentally on one of the lorries aboard the train. Prosecutor Gerald Lesigne, who is heading the investigation, said: "We are looking at facts which point to an accident... at this stage no indication on the origin of the start of the fire is possible." Jacques Gounon, chief executive of Eurotunnel, which operates the tunnel, said he also had no reason to believe the cause of the fire to have been "criminal". But he rejected early reports suggested the blaze may have been caused when a lorry's brake system overheated, causing a tyre to explode. Fire started on lorry (1) just before 1500 BST on train from Folkestone to Calais. Lorry drivers heard series of explosions. They broke windows (2) to get out of amenity car. Altogether 32 people, including seven Britons, were evacuated into service tunnel (3). Investigators are likely to examine the presence of a lorry carrying highly flammable carbolic acid, or phenol, which is reported to have overturned before the fire. Whatever the cause, the incident will bring the tunnel's safety standards under scrutiny. Mr Gounon said Eurotunnel was "well-equipped" to deal with any operational incident and had "demonstrated its abilities to respond effectively". But the fire has prompted Conservative MEP and transport spokesman Timothy Kirkhope to demand a full inquiry by the Channel Tunnel Safety Authority into chemicals in the tunnel. "Many people will be asking why such chemicals are granted authorisation when even LPG passenger cars are banned for safety reasons," he said. After a 1996 fire in the tunnel, which caused £200m of damage, firefighters' unions were highly critical of the design of freight train wagons. While cars using the tunnel are parked in containers, lorries on freight services are not enclosed. Channel Tunnel operators had originally looked into providing fire-resistant sealed wagons to carry HGVs. However, according to the Rail Accident Investigation Board, they would have been too heavy and so the requirement for them to be fire-resistant was scrapped. As a result, freight wagons were built with a roof and fireproof floor but with "perforated" sides and open ends which allow air to fuel any fire that breaks out as the train moves. 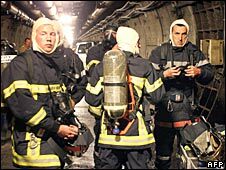 Fires in enclosed spaces such as tunnels are difficult to tackle for firefighters, who arrive on the scene to be confronted by thick black smoke. Sean Bone-Knell, assistant director of operations with Kent Fire and Rescue, said crews faced intense humidity and temperatures of up to 1,000C (1,832F) for stretches of almost six hours at a time during the latest incident. "It was a very, very strenuous incident for the firefighters to deal with, a very different incident to what they are used to," he said. "It would have been very arduous for them with very hot, humid conditions because the heat and fumes have nowhere to go." Kent crews work in tandem with French counterparts, using a prepared Bi-National Emergency Plan (BINAT) to deal with incidents. The Channel Tunnel is made up of three separate 50km (31-mile) passages -two main rail routes, with a service tunnel running between them. This smaller tunnel, connected to the others by cross passages at 375m (1,230ft) intervals, plays a key role in the firefighters' emergency response. It is their access route to incident scenes and contains a 25.4cm (10 inch) water main and high-pressure pumps. Higher air pressure is also maintained in the service tunnel to stop smoke getting into it and ensure clean air continues to pass through. A report by the US-based National Fire Protection Association into the 1996 fire described how this aided the firefighters. It said the air pressure, flowing through a cross passage and into the rail tunnel, created a metre-wide "bubble" where firefighters could safely stand. "Passing beyond this boundary meant facing intense heat and smoke, which required full protective gear," said the report. "Even so, the crews came back after 8 to 10 minutes 'looking like lobsters'. "Firefighters also had to dodge pieces of concrete falling from the tunnel ceilings and walls. "The debris also collected on the tunnel walkways, creating a sloping surface that was difficult to walk on. "It, too, was intensely hot, according to firefighters whose soles were burned from standing on them." Even though the main source of the fire has been dealt with, the firefighters still have a tough job. Kent's Chief Fire Officer Bill Feeley said conditions would remain difficult even hours after the initial call. "Imagine one burning tyre and the smoke that emits. When you put that into a very confined space, that's still a lot of smoke," he said. "We've got to work and make sure that we actually put the fire out and it's completely extinguished. "There's still a big job of work to make sure the investigation is done properly. "That means preserving the scene of the fire, to make sure we've got all the evidence and it's properly available to us."